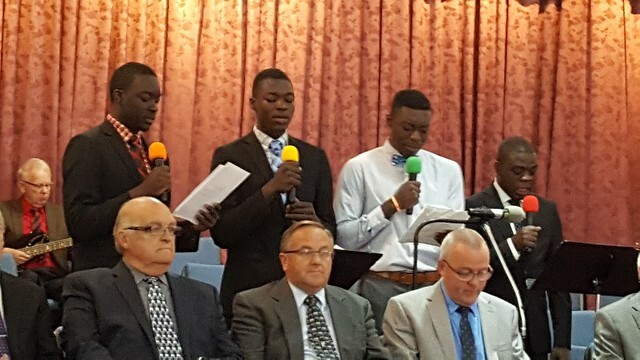 The Apostolic Faith camp meeting in Newfoundland, Canada, was held August 5-12 at the headquarters church in Roddickton. This camp meeting commemorated the seventy-fifth anniversary of the Newfoundland work, which began in Roddickton. Attendees came from the five churches in Newfoundland (Bide Arm, Birchy Bay, Englee, Roddickton, and South Brook), as well as other branch churches across Canada. Gary Bertram, from Chehalis, Washington, who attended with his wife, Sandra, was a guest speaker. Robert Downey, Director of North America Work, also attended with his wife, Cheryl. Before each service, the piano, guitar, and accordion instrumentalists played music to set the tone for the worshipers. Foluso Oladunni, the group leader in Edmonton, Alberta, opened most of the services with beautiful hymn renditions on the violin. He was also joined at times by other violin players. All the music specials were inspiring, including solos and ensemble numbers from the various churches, as well as selections from a large combined choir. The services on Tuesday, Thursday, and Friday mornings were Bible teachings. On Tuesday, Vanzel Quinlan from Birchy Bay gave a teaching on cultivating a greater hunger for God and His Word. On Thursday, Marjorie Reid, the pastor in Fort McMurray, Alberta, spoke on sanctification and the need for holiness. The teaching on Friday was given by Michael Ivany, the pastor in Englee, and focused on the work of the Holy Spirit in a sanctified believer’s life. On Wednesday morning, a minister and spouse meeting was held, and afterward, a delicious lunch was provided by some of the ladies in the church. In the afternoon, everyone was invited to the fellowship hall to view historical photos and displays of the work in Newfoundland. These included replicas of the first church in Roddickton and a boat used to evangelize the island. The service on Wednesday evening was dedicated to the history of the work in Roddickton and Newfoundland. It began with a violin duet, followed by the choir singing “The Same Old Way.” Chris Hewlett, District Superintendent of Canada Work, read passages from Ephesians 2 and 3, and paid tribute to the Gospel veterans who labored to establish the work over the past seventy-five years. Then members of the Hancock family sang “Abide with Me,” the favorite hymn of Gideon Hancock, who started the work in Roddickton in 1943. Cristopher Mitchelmore, a member of the Newfoundland and Labrador House of Assembly, spoke about the impact the Apostolic Faith organization has had in Newfoundland and throughout Canada, including the recently built senior housing units and the development of the youth camp property. He then presented a seventy-fifth year certificate to Brother Chris and the Roddickton church. Rene Cassell, who was District Superintendent of Canada Work for twenty-five years, gave an overview of the history of the work in Newfoundland and Canada. He told how an Apostolic Faith paper made its way to the northern tip of Newfoundland, which the postmaster gave to a school teacher named Gideon Hancock. He put it in a trunk and forgot about it until after he moved to Roddickton and came in contact with a group of people seeking the baptism of the Holy Spirit. He then wrote to the Apostolic Faith in Portland, Oregon, and that is how the work in Roddickton began. On Saturday evening, the service was held outside in the church parking lot. The chairs were placed so that the singing and preaching could be heard across the harbor. Some sat in their cars or stood outside listening to the service, and a number of cars stopped along the way as they drove by. Before the sermon, Ralph Randell sang “Life Has Many Choices, Eternity Has Two.” George Burton, from South Brook, preached a moving message on Jesus’ soon return, and exhorted the congregation to consider their latter end. The final Sunday morning service began with a violin solo and a children’s group singing “Hallelujah Anyhow” and “Lord, Listen to Your Children Praying.” Before the sermon, Clarence Hancock sang “Heaven Is Sounding Sweeter All the Time.” Brother Bob took his text from Joshua 2:18 and 21, and encouraged the unsaved to take advantage of this “window of opportunity” to receive deliverance from their sins. The Sunday evening evangelistic service was followed by a water baptismal service. The church was full, including many from the community. Brother Gary took his text from Matthew 3:1-6, bringing out that the same repentance preached by John the Baptist is still necessary to receive salvation. Eight candidates were water baptized, followed by congregational singing and the plea for others to pray through to salvation and be water baptized. The Newfoundland camp meeting was a wonderful time of spiritual renewal and fellowship. All who attended from near and far were blessed by being there, and the prayer is that they will use what they heard to be an inspiration to others in their home churches.